Summer doesn’t officially start until June 21st, but guess what? Even when Austin's mired in 50-degree days, there are still a wealth of fantastic date night (or day) opportunities for the romantically inclined here. But what if you're just not that creative? Fear not; we’ve put together a collection of date ideas that eschews lame clichés with plenty of fun options designed to make you seem interesting, from art gallery tours to classic movie screenings. And hey, if it doesn't work out, you can always salvage the experience with some late-night eats. Depending on what side of town you’re on, there are a few great options here. Northsiders check out Hi Tunes Karaoke -- it has clean rooms, is BYOB and BYO-food, and is open almost all night! Southsiders: The Highball’s TV- and film-themed private rooms are a blast and are free to rent from 4:30pm-7pm all week. Pro tip: The blacklight in the Twilight Zone-themed room will make your teeth look green; go for the cozy Twin Peaks-themed room instead. This is probably best suited for a third date, once you’ve come to terms with introducing your weird friends to your new person. Geeks Who Drink are all over town, all week; find a spot near you and seal the deal with your team’s vast knowledge of fictional planets. Shoutout to Qo’noS! We’ve all been there -- you’re at The White Horse, there’s a hoppin’ bluegrass band playing, and the dance floor is full of intimidatingly great dancers. You go out there and proceed to spin your date the wrong way, step on her feet, and almost drop her during the dip. (I’ve been dropped, and it’s not fun.) 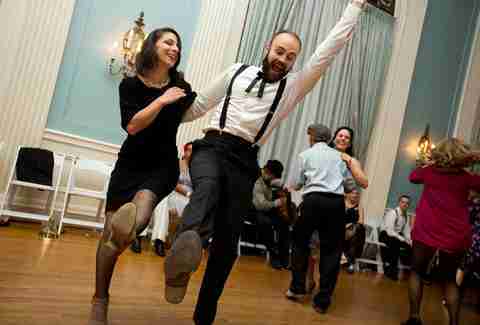 Lucky for us, all the dance instructors from Two Left Foots are there to baby step us into legit two-steppin’ masters -- every Saturday at 7pm at The White Horse... FOR FREE. Take in some culture from the Blanton's permanent and rotating collections. On the third Thursday of every month, the museum stays open until 9pm -- perfect for a post-dinner hangout. Formerly known as Legendary White Swan, beloved eastside spot King Bee is a new incarnation serving craft cocktails (try one of the rotating frozen drinks) and fantastic pizza. Every Monday, you can check out The Little Elmore Reed Blues Band at 10pm. Monday dates are way less pressure. Show your date you’re cultured and head to Southeast Austin, where Fitzhugh Road has become the place for breweries and distilleries to set up shop and give free tours and tastings on weekends. Start at Treaty Oak Ranch for a distillery tour followed by cocktails and smoked meat at Ghost Hill Restaurant, then hit Argus Cidery, Revolution Spirits (Austin Reserve Gin, Amaro, and Coffee Liqueur), and Last Stand Brewing, which are all on the same block. 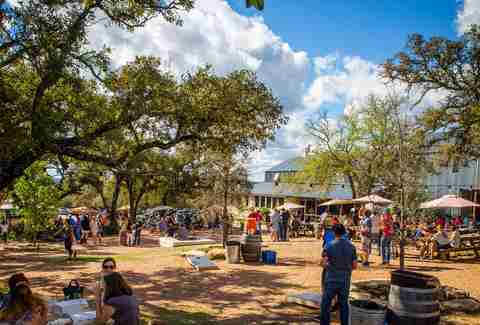 Then, mosey on down to Jester King Brewery for pies and uniquely crafted, award-winning beer from Stanley’s Farmhouse Pizza. Check out your date’s competitive side -- while wearing goofy shoes. Although Dart Bowl is famous for its greasy enchiladas, maaayyybe skip those this once. Also, Friday and Saturday evenings, UT students get one free game with a student ID. 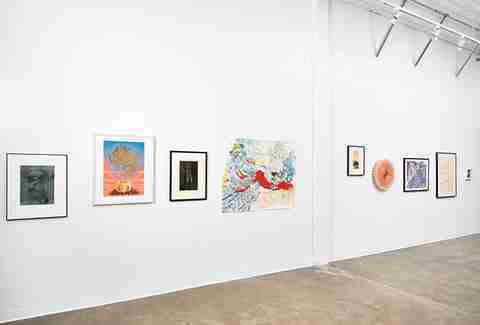 Canopy is a huge creative arts complex that hosts Open Canopy on the first Saturday of each month from noon-6pm, and galleries and artist studios are open to the public. Check out the special events and workshops that are coming up. Stroll arm-in-arm down South Congress, from Barton Springs Road to Elizabeth Street; the block is taken over by live music, craft vendors, and food. People-watch, and then have a drink on the beautiful courtyard of the San Jose afterwards. Channel your inner senior citizen with a rousing game of bingo at one of Austin’s bingo halls. There’s B-12 Bingo (South), Lucky Lady Bingo (Central), and Big Star Bingo (North). Just make sure you sit in the non-smoking room. BYOB is acceptable, as long as it’s accompanied by good behavior. Pinballz is famous for its vast collection of classic pinball machines and new-school arcade games. Win game tickets and hook your date up with something from the prize shop. A spider ring? A handful of Tootsie Rolls? The sky’s the limit. Pro tip: you can BYOB; the catch is they must be brought in one at a time. There’s a talented group of writers, actors, and comedians at The New Movement, and they host free -- and practically free -- events all week. Every night, catch one of their original comedy shows; they range from inappropriate to political to hilariously absurd. Check out the calendar here. Also... BYOB! OK, it’s the 21st century, and there are no real speakeasies left. 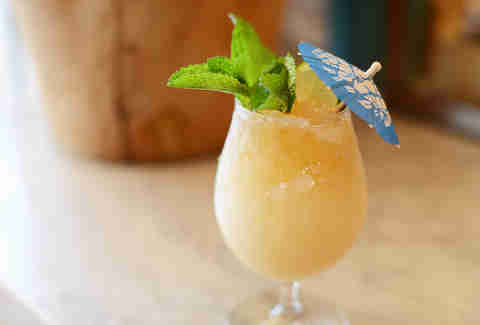 BUT, there are bars that give you the feeling that you're sipping drinks somewhere no one else knows about. 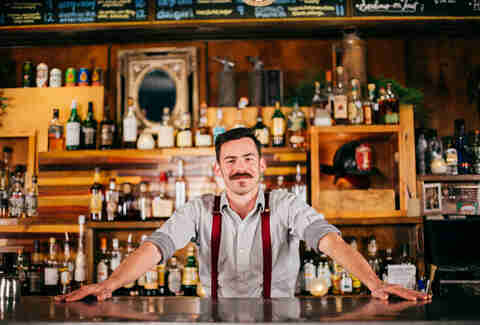 Check out the unmarked Midnight Cowboy on Dirty Sixth, the found-behind-a-false-bookcase Firehouse Lounge, and Vinyl, which is accessed through a fake barrel inside Tellers. Austin very first ping-pong bar, SPiN, is scheduled to open on May 19 in the 9,000-square-foot original Antone’s on West Fifth Street. The combination of elevated food, cocktails, and ping pong -- played on state-of-the-art, Olympic-style tables -- has already taken off in major cities like New York, San Francisco, and Seattle, and is an excellent recipe for a fun date. Expect tournaments, private lessons, dance parties, casual play, and plenty of private lounge space. As if you need another reason to love Austin, every summer sees the return of outdoor movie season -- and consequently, our comprehensive screening calendar (stay tuned for that). Sound & Cinema and Movies in the Park both host free films that start just after Sunset; Sound and Cinema pairs films and live music with food trucks and alcohol sold onsite, while Movies in the Park has a simpler, non-alcoholic (but still romantic) picnic vibe. Whichever one you choose, don’t forget to bring snacks and a cozy blanket! Austin Film Society now has a two-screen theater showing independent, arthouse, classic, and cult films, both old and new. These are films you won’t find on any other screens in town, and better yet, AFS Cinema also has a menu of elevated snacks (like Smokey Denmark hot dogs), beer, wine, and cocktails (like the Firing Squad: Espolon blanco tequila, Angostura bitters, lime juice, pomegranate molasses, and Topo Chico). Antonelli’s, Austin’s premier cheesemonger (aka the folks who provide the good stuff to top restaurants), offers a variety of classes, both at the shop and at cool spots around town, which include pairings with local beer, jam, and more. Spend quality time with your date while you learn all about the origin and aging process of the expertly curated selection at Antonelli’s. Best of all, the classes are always BYOB, so be sure to grab a bottle on the way! Picture you and your date sipping a boozy concoction out of a ceramic poodle or blowfish with two long straws, just like the idyllic ‘50s soda shop image... only way better. 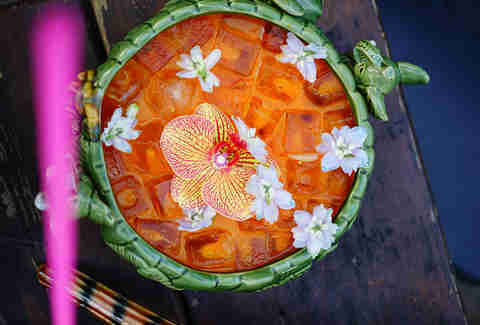 Try the shareable Rings of Saturn (gin, passionfruit, lemon, falernum, orgeat, Peychaud's) from Whisler’s, Puff Puff Pass (sweet potato shochu, aged rum, pecan, grapefruit, five-spice bitters) from Kemuri Tatsu-ya, or the Jay Jay Bowl (tiki rum blend, macadamia nut, coconut, lime, pineapple) from Midnight Cowboy. Texas agriculture probably calls to mind cows more than chardonnay, but there are a growing number of vineyards in the Austin area well worth a day trip detour, either on a chartered bus or with a DIY route through Fredericksburg and beyond. If your date is nice enough to sip 'n spit so you can relax with a couple of glasses of vino, you’ve found yourself a keeper! 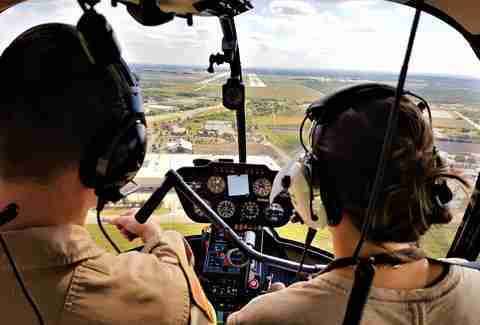 Sometimes you just need to get above it all, and what better way to do so than with a romantic helicopter tour of downtown Austin? There’s a reason people on dating shows are always being shoved into helicopters together; the sweeping views of sunset and skyline, combined with the frisson of being reminded of your own mortality, really gets the heart pumping. 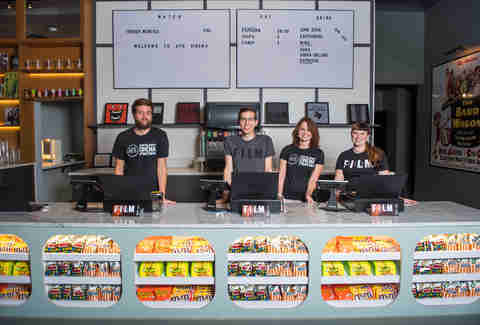 We all love the Alamo Drafthouse, but it's a safe bet you’ve been snoozing on its special events. From Champaign Cinema, which pairs your favorite fluffy films with a signature cocktail, to Fist City, cult action and thriller movies from the '70s on, to the eternally popular Terror Tuesdays, there’s something for everyone at the Alamo. Unless your date just doesn't like movies, in which case… what are you doing with them in the first place? 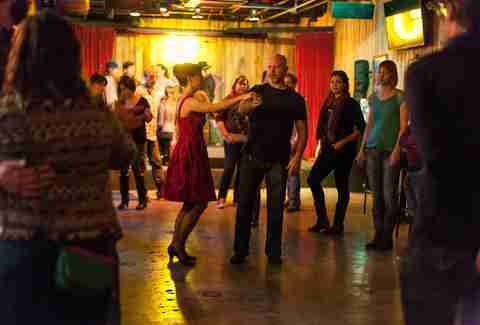 The Austin Swing Syndicate has been hosting weekly swing dancing parties in the ballroom of the historic Texas Federation of Women’s Clubs building since 1999. Isn’t it about time you joined the fun? Whether you and your date are total newbies, here for the introductory lesson at the beginning of the night, or old pros ready to dip and flip to the live jazz in the side rooms, Thursdays at the Fed are a guaranteed good time. Enjoy a leisurely exploration of the city with a Rocket Electrics Austin Foodie Tour. The name really says it all: the tour is guided by local foodies with a deep knowledge and appreciation of the food scene in Austin, and includes an electric bike rental and four courses of food at some of the hippest restaurants in Austin. Unlike a traditional bike tour, these bikes can do as much or as little of the work as the rider wants -- in other words, keep your date from seeing you sweat by letting the bike do all the work. Couples cooking classes have become something of a cliche, but for good reason. All that chopping, stirring, and basting pays off with a delicious meal to share! Plus, you can take home your hard-earned new skills and impress each other with gourmet new creations to take to work for weeks to come. Kitchen Underground, Freda's Kitchen, and Patricia's Table all offer classes for all skill levels, beginners and experienced chefs alike. Sure, a library date might not be ideal for everyone, but if you haven’t been to Austin's new central library yet, you’re both missing out big time. In addition to the hundreds of wonderful books and informative classes on everything from bullet journals to romance novels, the new central library also boasts a ton of public art events, a gorgeous, light-filled space for reading and lounging, an adorable gift shop, and even a publically curated zine library. If your date's into books, this is an easy choice. With all those gorgeous old barns peppering the countryside, is it any wonder that the Austin area is home to some of the best flea markets in the country? 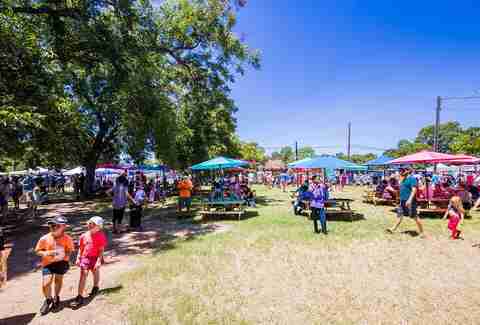 Start off with a weekend trip to the Austin County Flea Market, the oldest and largest of the bunch, where you can explore the wares of over three hundred vendors, while enjoying food and live music, or get a little funkier at the Austin Flea, where you can focus on their big three: handmade, vintage, and local products from artisans of all stripes. Treat your date to a day at one of our MANY festivals which celebrate food, drink, music, and the area’s most awe-inspiring natural features. Hot Luck (May 24-27) is all about the best in food and music; Austin Ice Cream Festival (June 23) is a literal lick fest; Float Fest (July 21 & 22) will combine tubing with an insane lineup including Snoop Dogg, Tame Impala, and Run the Jewels; The Austin PRIDE Festival and Parade (August 11) will be one of the most fun and colorful events of the year. 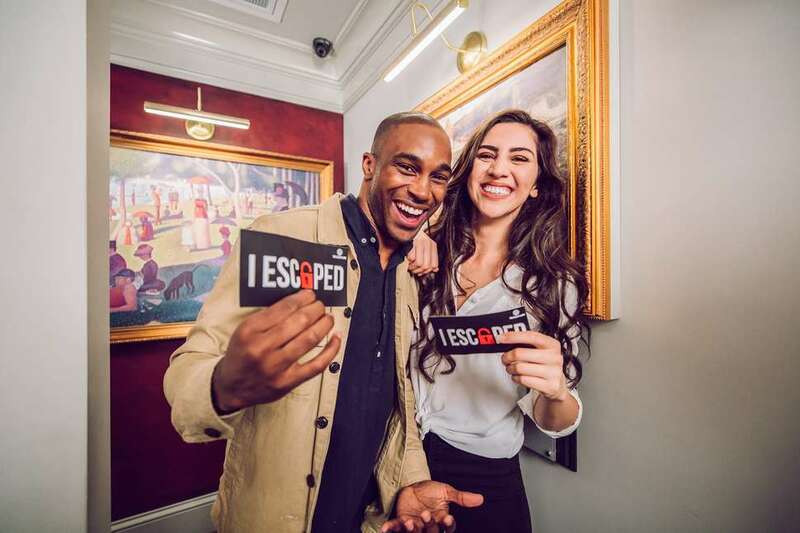 Imagine five semi-buzzed adults, frantically searching for clues and shouting while trapped in a log cabin -- that’s the Escape Game. The challenges are extremely addictive, you have 60 minutes to escape a series of rooms using logic, problem-solving, a few much-needed hints, and most importantly, communication skills. What better way to get to know your date? Challenges rank in difficulty from “we got this” to “OMFG this is impossible,” as you’ll find out in the Jail Break experience. We all know the Elephant Room as the OG underground jazz club where local and touring jazz talent play shows, but you can (and should) also visit the recently opened Parker Jazz Club for a more high-end experience, complete with classic cocktails perfect for a special date. 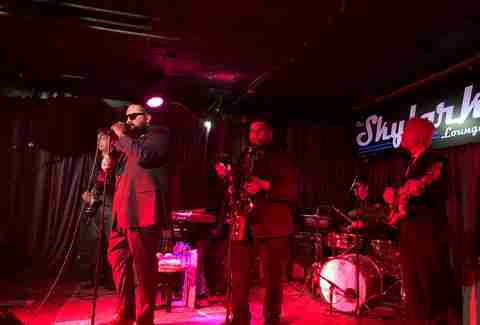 If blues is more your thing, the Eastside’s Skylark Lounge is a cozy venue where the authenticity is palpable thanks to regular performances from Austin’s living legends. Gain some relationship insight through a tarot card reading at Native Hostel every Sunday from 6 to 8pm for $10, or enjoy complimentary readings at Eastside speakeasy Milonga Room every fourth Thursday of the month (reserve a spot and get the secret password). Irene’s is also hosting Tarot & Tequila Tuesdays, with free tarot readings while enjoying $3 shots of house tequila, $5 tequila punch, and $4 frozen or rocks margaritas from 11am to midnight. Anastacia Uriegas is an Austin-based writer whose worst date ever was with a unicycle-riding amnesiac. Follow her other misadventures at @anaurie.